How many times have you owned something that has broken due to a manufacturer defect, but didn’t try to get a replacement product (or your money back)? These products can range from cheap plastic toys from the dollar store to high priced autos and even homes. When I was young, I got into the habit of just tossing away a broken toy rather than trying to fix it. It wasn’t because my family had the money to buy a new one. Rather, I was just too lazy to try to fix it. 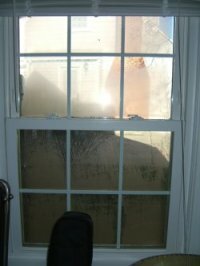 When we bought our home in 2004, we noticed a few windows had mildew between the inner and outer panes of glass. In our offer letter, we asked the owners to replace the windows, but they declined. This was our first home, so we were inexperienced, and our agent didn’t help to push the matter further (I think she was secretly working for them). We did get the owners to leave many of their receipts, warranty papers and manuals behind for much of the home, but the one thing they didn’t include was information about the windows. The windows had been replaced in 1998, along with the roof and siding. I figured that the windows had a 10 year warranty, so I had some time to get them replaced. As the years went on, more windows became afflicted with the mold, but we didn’t really use those windows. “Out of sight, out of mind” right? Since this was year 9 of the assumed 10 year warranty, I figured I should get on the ball and contact the manufacturer. In January I got the claim forms, but sat on them for 5 months! Looking back, I have no idea why I didn’t submit them sooner. Honestly, I think I was afraid that the manufacturer would accuse me of fraud, or that it would be a long, labored process to get them to comply. I really didn’t know what to expect. In May, I emailed the electronic form to the fulfillment office, asking for help to complete some of the information. They responded within a few days to call them directly. I complied and walked through the process with the extremely pleasant agent. She informed me where to get the window size and product number information (a sticker on the side of the sash), and what to expect moving forward. 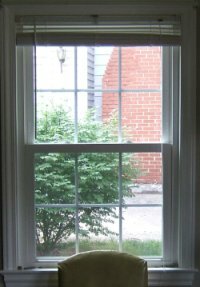 Basically, they just needed the size of each affected window and whether it was the top or bottom sash (we have “double-hung” windows). They updated some information in their computers (since we were new owners), and sent the replacement windows to the original installer’s shop. Timeframe? 3 weeks from my email to picking up the windows. The manufacturer didn’t even send someone out to inspect the windows! However, labor was only covered for the first 5 years, so it’s up to me get the windows installed. I can confidently state that the main reason the process went so efficiently was because the previous owners contracted a manufacturer-certified installer. Why is this important? Many manufacturers want to be more sure that their product was installed correctly the first time, rather than guessing whether it was their product that failed or shoddy installation. Granted, anyone can make a mistake, but certified installers tend to stick around in the business longer than a fly-by-night operation. A word of caution: Resellers like Lowe’s and Home Depot contract installations to subcontractors who may or may not be certified installers. If you try to go through the reseller for a warranty claim, they’ll most likely redirect you to the subcontractor. That sub may or may not still be in business (or even in the country). Always perform due diligence to determine whether your installation will be fully covered under the manufacturer’s warranty before the job is started! Who fulfills the warranty claims? How long have you been doing business with this warranty company? Does the installer need to be certified? What could void the warranty? Warranty Claims: Viwinco. I was really impressed with their friendly and courteous attitude, and patience with my lack of knowledge about windows. Also, you might think that replacing the windows involves the entire window frame. Nope. I have a top and bottom part of the window (aka “double-hung”). Each of these parts is called a “sash”. The sash is what slides up and down (or swivels out, depending on your window) in the window frame. You remove the sash and pop in the new one (carefully). We had to transfer the locks to the new windows, as well as security system parts, but each window is getting simpler to fix than the last. Yet another chance to use my truck (to haul the 10 sashes) and be a manly homeowner (by fixing stuff myself)! Excellent tips and advice with this story. The warranty is a right that we have as a consumer. Warranty is what we offer our customers, they pay their money, they have to get the best product and services. Many people should read this.